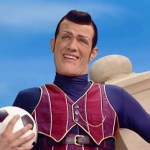 If a Croatian TV broadcaster acquired LazyTown, and redubbed the first season and dubbed the 3 remaining, which would be the cast? And what would be the name of the songs too? If we only knew anything about Croatia.. Yes, it is very difficult to know the voice actors of Croatia.